I bet you havent heard of Salsify. Mummy says not many people have. Salsify and Scorzonera are two vegetables that are almost the same except the second one has black-skinned roots. In Germany it is called Schwarzwurzel which means blackroot. I haven’t tried the root but the leaves are delicious. They are even nicer than celery leaves, cucumber and parsley. Mummy grows the roots for herself but she says there are always bits of the root left in the ground when she digs them up in the middle of winter. They grow again in the spring and give us lovely fresh leaves. We’ve been eating them since early March. They don’t mind frost either. The leaves are usually very long and thin unless they are growing into a flower stalk, then they seem to get wider. Fred and George liked them so much they would start at each end of a leaf and work towards the middle. They’d have a tug of war to see who got it. Fred usually won. Mummy would make sure George got his share though. This picture was taken when George was having tooth trouble and got abscesses on his throat and chest. You can see he’s been shaved! Mummy took very good care of George. She takes care of all of us but George needed the most medical care. Mummy usually gives us at least two leaves each though, so there’s not usually any need for a tug of war. Just to make sure, I usually sneak away to a private corner with my favourite foods. Salsify being one of them. It’s easier to say and type than scorzonera. We also quite like strawberries, although strawberry leaves are very nice too. We get a bit fed up with them though, and later in the season they get a bit tough. We had some nice ones yesterday when Mummy pulled some up in the garden because she had too many. Then there are some nice leafy vegetables, spinach, sorrel and swiss chard (which is also called chard). Sweet corn is delicious. We usually get the husks round the nice fruits as mummy has the fruits and says they are too fattening for us. Sometimes we get some as a treat though. Or if we need to put on weight. Mummy started growing her own sweet corn when she discovered how much we like the leaves and stalk of the sweet corn plants. We adore the leaves. They are even better than the husk. When she thins out the plants she gives us the thinnings to eat and they are marvellous. Then at the end of the season she gives us the stalks to chew on. They are quite hard work by then, but good fun. It’ll be interesting to see what Dylan and Dougall make of them when they see them in the autumn. They’ve not met sweet corn yet. They love their salsify leaves though! Mummy took superb care of George, and I know G loved her very much. You boys are extremely lucky to have her. I’d never heard of salsify until I went to a rather posh restaurant for a business lunch, probably over 10 years ago now. None of us had heard of it, and “salsify” became a running joke among my coworkers. It’s a funny word, isn’t it? 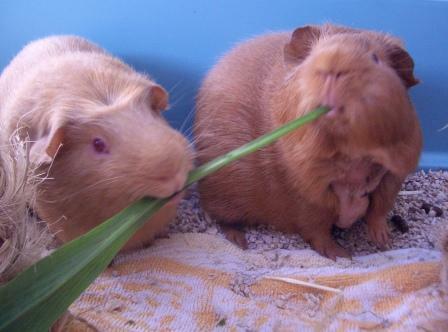 Saku and Willoughby have had baby corn a few times. Or was it Saku and Mariusz? Anyway, it was a huge hit.